John Singer Sargent (1856–1925), The Ladies Alexandra, Mary, and Theo Acheson (The Acheson Sisters) (1902), oil on canvas, 273.6 x 200.6 cm, The Devonshire Collection, Chatsworth House, Derbyshire, England. Wikimedia Commons. I recently wrote about an example of allusion in the portrait paintings of John Singer Sargent, based on Bruce Redford’s excellent new book. I cannot resist one more – this time relying on both Redford and the great Sir Ernst Gombrich – which may cast new light on Sargent’s art. One of Sargent’s most prestigious portrait commissions was for the Duchess of Devonshire, who incongruously lived in the vast stately home of Chatsworth House in Derbyshire (which is well worth visiting), as do her modern descendants. Her three grand-daughters, by her first marriage, were to be the subjects, and Sargent visited Chatsworth during 1901-02 to discuss details. 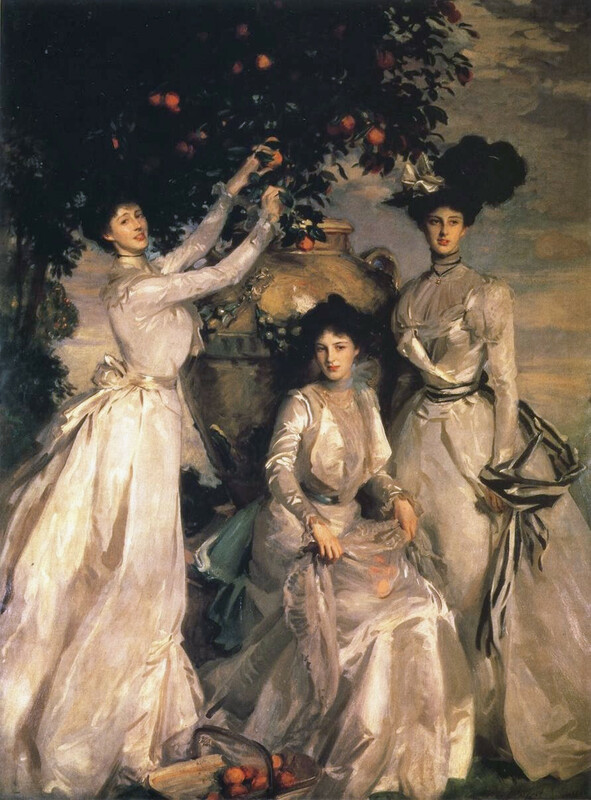 His completed painting of The Ladies Alexandra, Mary, and Theo Acheson, normally simply known as The Acheson Sisters, was exhibited at the Royal Academy in 1902, where it was both very popular and favourably received. And at first sight, it is indeed a delight, as they sit around the front of a huge urn which is decorated with floral garlands, one of the ladies reaching up to pick oranges from a tree just above the urn. Even the late Queen Victoria would, I am sure, have approved. To understand Sargent’s allusory meaning, we have to look back to two portraits painted by Sir Joshua Reynolds. The first, from 1773, shows the Montgomery Sisters, although its formal title is Three Ladies Adorning a Term of Hymen. These three young ladies are depicted in a rather different composition, with some striking parallels. Instead of picking oranges, they are engaged in equally nugatory ‘work’ of making floral garlands, rather more substantial than those in Sargent’s painting. The garland is destined for the term behind them. Terms are a variant of the classical Greek herma or herm, a sculpture consisting of a head and shoulders (sometimes also a torso) on a plain column of square section. Although quite widely used for sculpted heads, they attained a notoriety with the Romans, who called them termini, hence the English word term. This reputation arose from their association with figures of the god of fertility, Priapus, which often featured male genitalia, sometimes of alarming size. It is notable that, whilst Reynolds’ term does not have a classical base with a square section, the garland cunningly passes in front of the area of its crotch. The title, though, tells us that this term was not Priapus, but Hymen, the far more respectable ancient Greek god of marriage ceremonies. So Reynolds has artfully steered us away from danger, and declared the three ladies’ interests in marriage. In fact one had even married shortly before he painted their portrait. 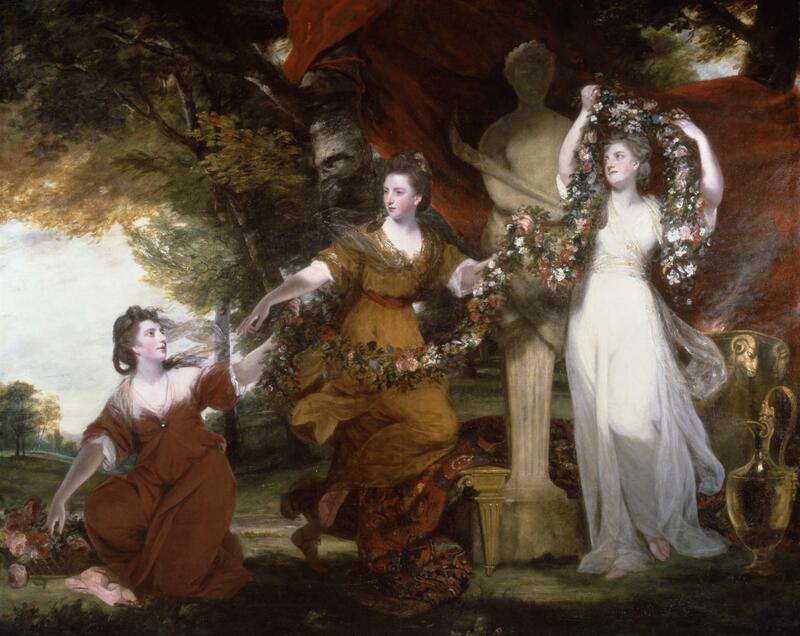 Note the pose of the central sister, whose left hand is passing the garland up towards the term, and balanced by the outstretched right arm; she is not looking at the term, but along the line of her right arm to her sister. Joshua Reynolds (1723–1792), Portrait of Lady Elizabeth Keppel (1739-1768) (1761), oil on canvas, dimensions not known, Woburn Abbey, Woburn, Bedfordshire, England. Wikimedia Commons. 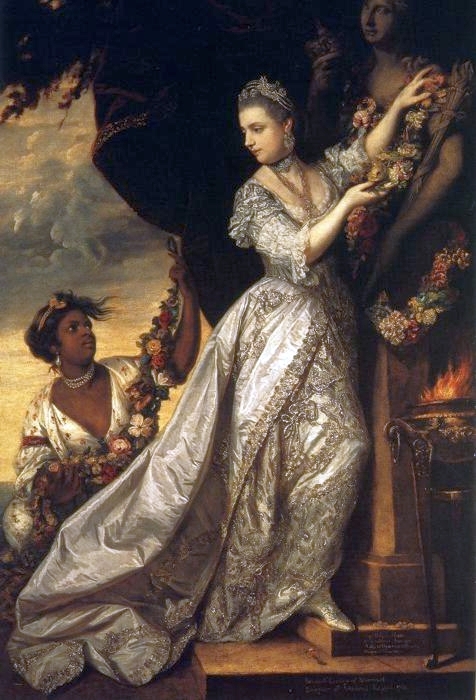 In his Montgomery Sisters, Reynolds not only alludes to (or quotes from) much older paintings, but also his own Portrait of Lady Elizabeth Keppel (1739-1768) from 1761. Here the central figure is seen adorning a term of Hymen with garlands, and has turned to her servant, who seems to have been busy making those floral tributes. Although in so turning, both her hands are up on the term (much like the Acheson sister who is picking oranges), she looks back and down towards her servant, and her knee is bent, tucked against the pillar of the term. The term here is more traditional, in its square-section column, but it has arms which bear a long bridal torch. Its worrisome crotch area is quite solidly blocked from view. Lady Keppel was unmarried at the time, and is shown wearing her bridesmaid’s dress from the recent marriage of King George III to Queen Charlotte. Her offering to Hymen seems to have done the trick, as she married the Marquess of Tavistock three years later. Sadly he died in a hunting accident three years after they married, and she died of tuberculosis two years later. Reynolds is also, of course, referring back to notable paintings from more than a century earlier, which could afford to be less coy about their terms, and generally quite ribald. Two are by Nicolas Poussin, and the third the product of the fruitful collaboration between Rubens and Jan Brueghel the Elder. Nicolas Poussin (1594–1665), The Triumph of Pan (1636), oil on canvas, 135.9 x 146 cm, The National Gallery, London. Wikimedia Commons. 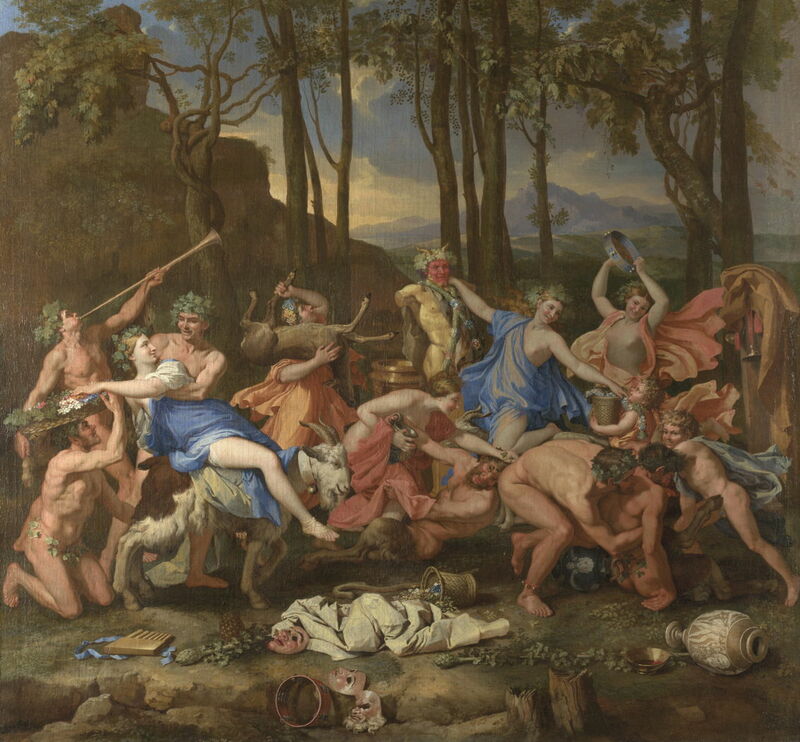 Poussin’s The Triumph of Pan (1636) is unbridled in its revelry, with the red-faced term at the back seemingly brought to life by the caress of the central maenad in blue. Look, though, at that woman’s position: her right arm reaches up and around the term’s neck, and the left stretches down the same line, along which she is looking. Her left knee, at least, is bent. 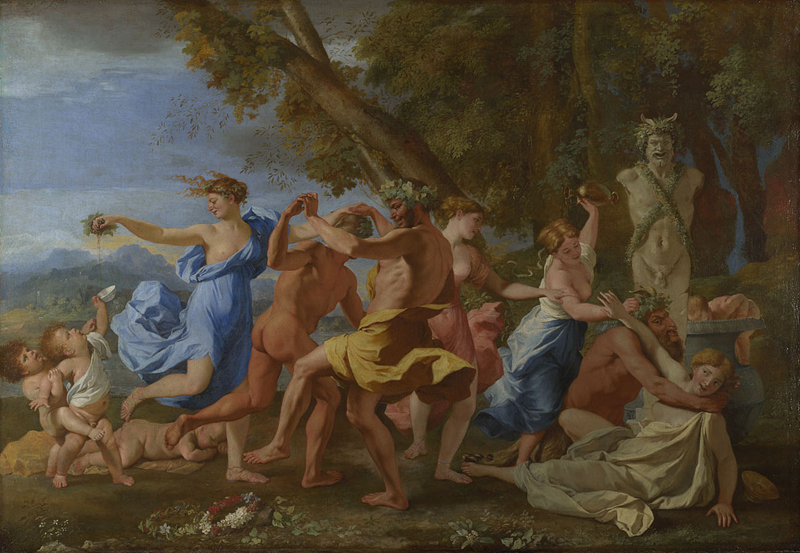 Nicolas Poussin (1594–1665), A Bacchanalian Revel before a Term (1632-33), oil on canvas, 98 x 142.8 cm, The National Gallery (Bought, 1826), London. Photo © The National Gallery, London. Poussin’s A Bacchanalian Revel before a Term (1632-33) is an earlier bacchanalian scene, in which a rather more explicit term is being feted and adorned. Another young woman wearing blue is close to the term, her left arm stretched up towards the term, with her right arm not quite as straight this time, but she is looking along the line of that arm, down and away from the term. Peter Paul Rubens (1577–1640) and Jan Brueghel the Elder (1568–1625), Nature and Her Followers, or Nature Adorning the Three Graces (c 1615), oil on panel, 106.7 x 72.4 cm, Kelvingrove Art Gallery and Museum, Glasgow, Scotland. Wikimedia Commons. 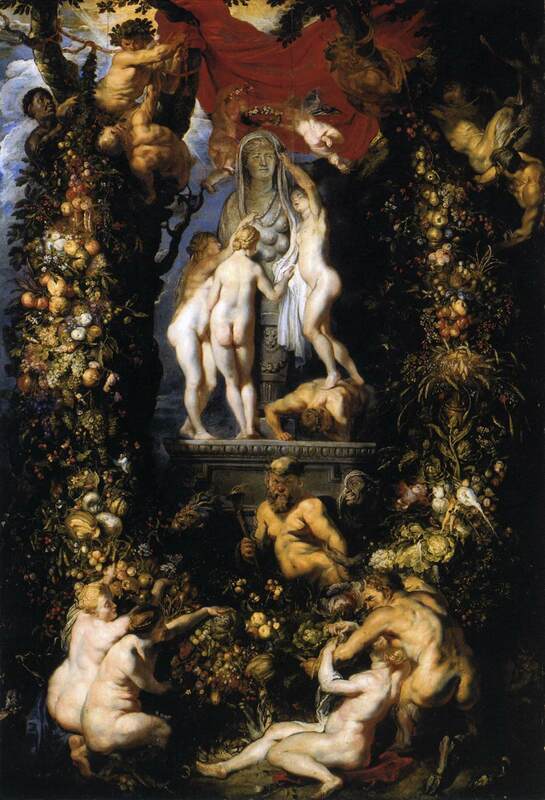 Within the joint work of Nature Adorning the Three Graces (c 1615), Rubens’ delightful little scene of the three Graces feting a term with about eight pairs of breasts – who Gombrich identifies as the Ephesian Diana – provides another source for Reynolds’ and Sargent’s triple portraits: the Montgomery sisters and the Achesons were clearly Graces, festooning the more socially-acceptable term of Hymen, hoping for long-lasting and happy marriages. But somewhere in the more distant past, those deeper urges were at work too. I can’t help wondering whether Sargent might have had a quiet chuckle, knowing just how close the Acheson sisters had come to a Roman bacchanal. Gombrich, E (1942) Reynolds’s Theory and Practice of Imitation, Burlington Mag. Feb. 1942, vol 80 no 467, pp 40-45. Posted in General, Painting and tagged allusion, painting, portrait, Poussin, Reynolds, Rubens, Sargent. Bookmark the permalink.